All good witch-family stories start with a curse and unjustified, and perhaps hysterical, charges of sorcery – such is the case of the curse on the Owens family, stretching back to the early seventeenth century. But, even in the more present day of the 1960’s where the three siblings, Franny, Jet and Vincent have only part of the story, many ill-gained conclusions and plenty of restrictions as their mother tries to keep them safe. Of course, the three are headstrong (would you expect anything else) and even daring to defy the rules so carefully put in place: rules they don’t always understand as they don’t really know the history. Not until Aunt Isabelle. Isabelle lives in Massachusetts where everything began for the Owens, and she’s of the belief that the children should know their history, their magic and how to use, not fear, it. As one would expect, the differences of the three and their abilities, as well as a rather insular approach to outsiders makes them objects of speculation and gossip – made even more apparent at Isabelle’s house where the stories and legends of the ‘curse’ on the Owens is a favored topic of discussion. Each of the characters becomes a fully formed person in this story: showing fears, desires and even struggles as they come into their own powers and knowledge of the family. 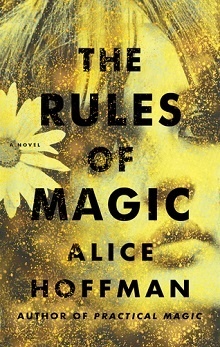 Hoffman builds a story that feels as if it does reach back hundreds of years, tendrils and tentacles of the past reaching forward to connect the family, the magic and even the struggles as they felt (and sometimes were) outcasts in their own home. Narration for this story is provided by Marin Ireland, and her smooth, almost effortless presentation of both dialogue and atmospheric moments allowed the story to move forward, allowing listeners time to visualize moments and absorb the subtle nuances in emotions, details and background information that added to my understanding and belief of the curse, the magic and even the potential for these three to move forward and make lives that were mostly happy. A wonderful mix of historic moments, acceptance and growth, all put together in a way that engages and captivates, whether or not you are familiar with the book or film to which this is background.